A beautiful blend of old mine cuts and the modern round brilliant, classic feeling cushion cut diamonds are worn by celebrities like Kim Kardashian, Sofia Vergara and Bar Refaeli and are quickly becoming one of today's most popular diamond shapes. The Ada Diamonds Concierge Team can curate a list of the best lab created cushion cut diamonds that are not available anywhere else and help you design a ring worthy of your romance. A timeless style made just for you. Showcase your conflict free cushion cut diamond with a glittering halo. Add a spectacular ring of diamonds to your band set in a metal of your choosing. Easily recognizable by their gently rounded edges, the cushion cut, sometimes known as a "pillow cut" or "candlelight cut", lends a timeless and feminine feel to any engagement ring. In eras predating our modern ability to cut diamonds, these beautiful diamonds were cut to maximize the brilliance they displayed in the candlelight of the day. Today, the most common cushion cut diamonds are known as "modified cushion cuts" referring to the additional faceting that has been made possible by modern cutting techniques, while still maintaining the graceful pillow shape that makes cushion cuts so noticeable. Ada's Diamond Concierge team can help you design a setting for your lab created cushion cut diamond with a unique vintage feel, or something spectacularly modern. 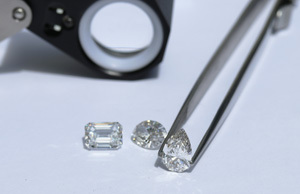 Ada receives the first right of refusal from diamond growers the world over, meaning your Concierge will curate a list of stones for you not available anywhere else. Inquire today to get started! Do you dream in color? Get creative with fancy colored lab grown diamonds to create a look that's truly all your own. Ada's Diamond Concierge Team will help you find the perfect fancy color for your custom engagement ring. Not sure what your sweetheart desires? Ada's Proposal Setting program allows you to propose with a beautiful solitaire, then re-design the ring together as a team. The full cost of the solitaire may be applied toward the purchase of a new setting with no re-setting fee.